W.S. Farish’s Code of Honor pleased Hall of Fame trainer Shug McGaughey Saturday morning while prepping for the March 30 Florida Derby (G1) as the 3-year-old son of Noble Mission worked for the first time since capturing the March 2 Fountain of Youth (G2) at Gulfstream Park. Code of Honor breezed five furlongs at Payson Park in Indiantown, Fla., in 1:01 and galloped out six furlongs in 1:13 4/5 by McGaughey’s watch. 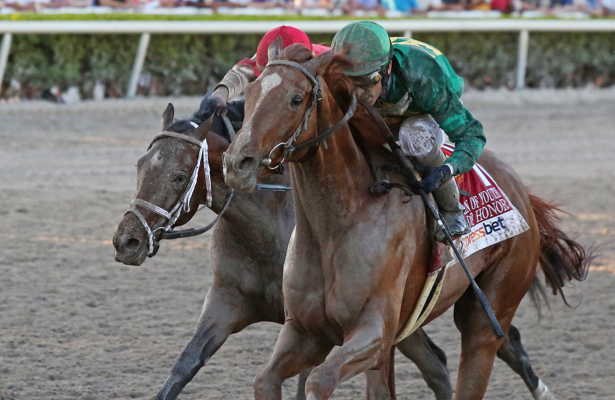 Although the Farish homebred disappointed in the 3-year-old debut in the Mucho Macho Man, he took huge strides along the Road to the Triple Crown in his two-turn debut in the Fountain of Youth. McGaughey is hopeful that Code of Honor can follow in the footsteps of Orb and also add a Florida Derby win to his resume. McGaughey saddled Orb for a victory in the 2013 Kentucky Derby after triumphs in the Fountain of Youth and Florida Derby. Also Saturday morning, at Gulfstream Park the Holy Bull (G2) winner Harvey Wallbanger breezed five furlongs in 59.66 seconds in preparation for a planned start in the Florida Derby. The son of Congrats is coming off a 29-1 upset victory on Feb. 2. The Kenny McPeek-trained colt had entered the 1 1/16-mile Holy Bull off a maiden victory at Churchill Downs Nov. 11 at 1 1/16 miles. Harvey Wallbanger worked in company with the McPeek-trained Signalman, who finished a disappointing seventh in the Fountain of Youth after completing a strong juvenile campaign with a victory in the Kentucky Jockey Club (G2) at Churchill Downs. Signalman, who is scheduled to run in the Blue Grass (G2) at Keeneland April 6, was clocked in a morning’s-best 59.46 seconds while working outside of Harvey Wallbanger.